The Jesse James Scrapbook explores the life and times of Jesse James and his importance as a national figure during the Civil War and Reconstruction eras. The tale is told through the voice of the press and people of America, fictionally recreated but based on actual historical sources. It is all here: chattel slavery, Bleeding Kansas, Quantril and his raiders, "The War for Southern Independence", the Younger Boys, the Pinkertons, the Northfield Raid and Cole Younger's capture and imprisonment. Robert Ford, "that dirty little coward," plays his role as an assassin and meets his ultimate fate in a Colorado boom town. Entertaining and provocative it is a fiction worthy of the true legend of Jesse James. Also read additional reviews on Barns And Noble. 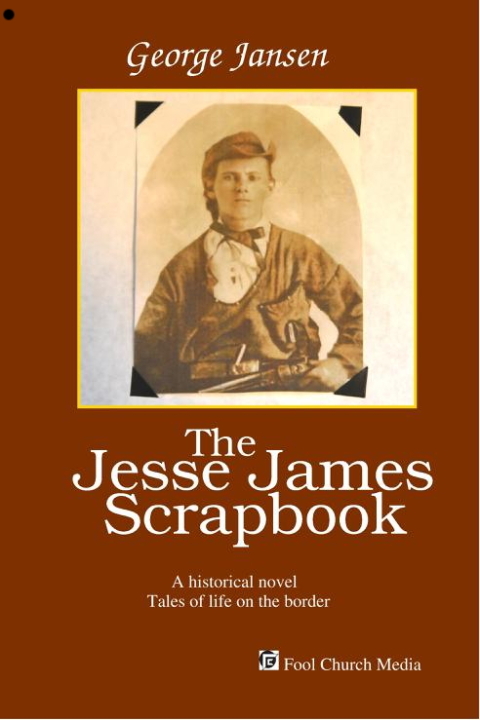 Mr. Thurston James read my novel and said this about it: "The Jesse James Scrapbook is a different kind of book. . . The cover says it is a novel, but it is not —it is a Scrapbook! Each chapter is a fragment of the James Boys life, told by a fictional witness. . . but it's stories are based on the traditional history of Jesse, Frank, Cole, and other gang members." Thurston, who passed away in 2005, was related to Jesse's mother and was one of the leading lights of The James/Younger Gang, a nonprofit organization of James aficionados. I'm very proud that a person such as he liked my book. I was raised in Monrovia, Missouri —a sleepy river village of white houses and brick buildings, an idyllic setting of the type that has not survived into the new century. Before the war, my people were numbered among the most substantial in the county —my father being owner and proprietor of the ferry at Monrovia and also its largest warehouse. But the war, as you might imagine, changed all that. Even though Monrovia was well north of the regular lines, my father's holdings were plundered by Yankees on more than one occasion. For a time we were protected from such marauders by Captain Arthur Howell and his Partisan Rangers. And it was while the Captain made his headquarters in Monrovia that I became acquainted with Jesse James. I do not recall the year in which the incident I am about to describe occurred, but I can tell you it must have happened on a Friday night in October. We were putting up apple butter, you see, and we always prepared the apples for cooking on a Friday night in October. The whole family —with the exception of my father who was serving with Sidney Marion Keats— was gathered in the kitchen. The smell of hot cider filled the air. Baskets filled with apples were piled everywhere. My sisters and I cored them as fast as we could, while mother cranked the old apple peeler. My grandmother was still alive, then, though quite old and wizened. Her corncob pipe and rude table manners betrayed a frontier upbringing. She was arthritic and deaf, besides, and yet it was she, that night, who first heard the beat of horses hooves. In an instant my mother was at the window. She pushed back the curtains as much as she dared and peered down the dark lane that ran past our house. My sisters and I sat frozen in fear, but when mother turned to us smiling, we knew all was well. "It's Bub Howell's boys," she said, "and one of them," she looked at me, "is pulling up right outside." My sisters giggled. My mother hushed them. "Now be quiet girls," she said with a smile. "You know how agitated Julia is these days." I assumed as haughty an air as I could manage at age sixteen. "I don't care a whit about Mr. Jesse James." At the time I despised, or thought I despised, the handsome, young Ranger. He came around whenever Captain Howell's company was in Monrovia but seemed to exhibit an interest in every member of the family but me. For my part, I tried to ignore him. It was only years later, in reflecting back on our immaturity and inexperience, that I was able to understand the true nature of our feelings. "Mrs. Fanning," Jesse said, as my mother showed him in. "Miss Julia," he said to me. Coolly, I thought. "Mr. James," I replied, pretending to be hard at work on an apple. Jesse was a mere boy, himself, I now realize. His uniform, so-called, was nothing more than odds and ends he had been able to gather. He was covered from head to foot with the dust of the road, but to me he seemed the epitome of the gallant soldier, a dashing cavalier upholding the righteous cause of the South. My mother set a chair for him, between me and my grandmother, and shoved a plate of gingerbread into his hands. He ate with a hunger he could scarcely conceal, but before I could think of even a single thing to say, my little brother was on him, begging to play with one of the two big revolvers that were thrust in his belt. "You're too little for such things," Jesse said, brushing the child's hands away. Then he smiled and pointed at the guns in turn. "This one, here, I call Beauty. This other one, here, I call Beast." My little brother touched a delicate finger to a big knife that hung in a scabbard on Jesse's waist. Jesse shook his head and laughed. "Don't you know nothin'? You don't name knives, just guns and horses." My grandmother lit that awful pipe of hers. "Kilt any Yankees?" Jesse patted Beauty. "I killed a fellow that was a chaplain with this one. Guess I'll pay for that, one day, if what the Bible says is true. But for now we must live by the law of the tooth and fang, that's what Captain Howell says." My grandmother persisted. "How many you kilt all told, boy?" Jesse thought for a moment. "Why, seven I can count for sure." "Seven!" Granny laughed, taking his statement for an idle boast. "Why, you ain't been in the army long enough to have killed seven men." "It's true," Jesse said. "Captain Howell says I'm the keenest fighter he's got, and I can prove it." He begged to be excused and, this granted, he proceeded out the door and into the yard. We all waited in bewilderment until, a few moments later, Jesse returned with the throat latch of his horse's bridle. "See here. See `em Julia." He passed the horrible thing right under my nose. "Well, by God," my grandmother exclaimed "One, two, three —well, by God, yes. There are seven scalps there." My grandmother was no stranger to the cruel nature of guerrilla warfare. In her day the enemy had been the Mormons, and she was used to such atrocities. But to me the "trophies" Jesse laid before us seemed to putrefy the very air. "See, Julia. That one there is the chaplain's." Blood rushed towards the top of my head, and I felt, for a moment, as if it might explode out my skull. "You are not a gentleman, sir, but a murderer and a savage. You may live by the law of the tooth and fang, but we are civilized people, and if you persist in acting like a beast, you are welcome to leave." "Julia Fanning!" my mother exclaimed. "Mr. James is your guest. You apologize this minute!" But it was too late for such civilized sentiments. The shy, handsome boy who had killed seven men in battle cowered before me like a cat that had been doused with a bucket of water. It seemed that he wanted to speak, but when words failed him, he bolted for the door. "Mr. James." My mother chased after him, but failing in that, she turned and began to scold me for my behavior. "Julia Fanning. What has gotten into you?" Already I had begun to regret my hasty words. I thought to chase after him, too, but before I could a pistol shot exploded in the yard. I jumped with fright and froze. We all fell silent and listened. Then, we heard the shout of a single word. "Hypocrites." And Jesse James was gone. Now, I deeply regret what I said to the young volunteer that night. Had normality and peace been the order of the day I imagine Jesse would have tried to impress me with his prowess as a ballplayer or wrestler. Perhaps he would have tossed rocks at me and my sisters as we walked home from school. Instead, all he could do was show me those horrid scalp locks for which, in his own soul, he must have paid a price beyond imagining. A few days later a column of Yankees under Captain Bowers moved on Monrovia with the intent of capturing or killing Arthur Howell and destroying his command. But it was Bowers, instead, who was ambushed and destroyed on a narrow, tree-shaded lane that ran not far from our home. Jesse James fought with great ferocity in that action, I understand, but did not take a single scalp. I have been told, in fact, that after that Friday, when we were putting up apple butter, he never scalped another man. I do not know if that is true or not. I do know, however, that he never came calling again.